update: After using this curriculum and some of the other levels, I have to say that we would not recommend this for our family. Many families love the style but I felt that we just did not learn what I was hoping to with this curriculum. It was too confusing for my children to catch on without any written instruction. It is a flashcard curriculum but we found that it does not teach the foundation concepts that we needed. 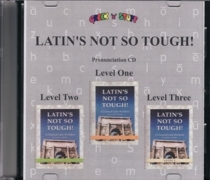 Today's review product is Latin's Not So Tough - Level 2 recommended for 6-7 year old from Greek 'N' Stuff. Greek 'N' Stuff offers Latin and Greek curricula along with some bible studies written by Karen Mohs, the founder. In our household, Sarah used this exclusively since the beginning of the school year. She is 7 and in the 2nd grade. We had the opportunity to review the student workbook, the answers only answer key, and the pronunciation CD for levels 1-3. 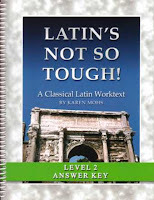 The workbook basically consists of worksheets for the student. 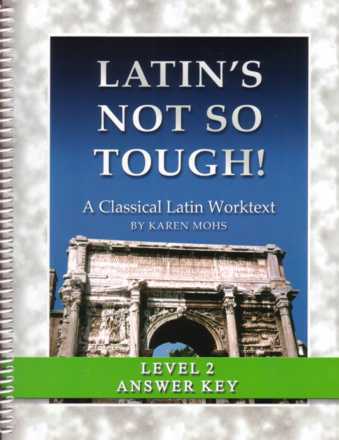 Level 2 focuses on a review of the Latin alphabet, diphthongs, special consonant sounds, and core vocabulary of 50 Latin words. The workbook is simple and in black and white. Repetition with the flashcards is the key to success in this program. 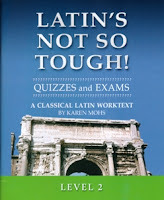 This is how to pronounce the Latin "Yy" sound. The instructions say, "form lips to say "oo", but say "ee" instead. Yeah, sure. I get the image of mule lips - do you? 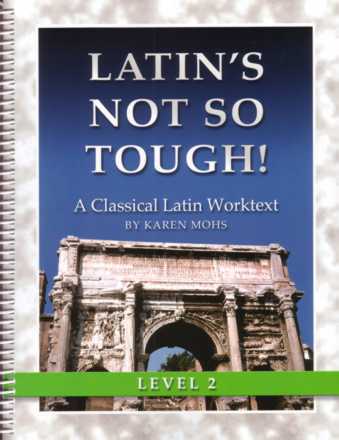 Latin's Not So Tough comes in six different levels with grammar instruction beginning in Level 3. Levels 1 and 2 are simply for younger students just beginning. 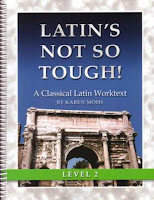 If you have an older child who is just beginning Latin instruction, the recommendation is to start at Level 3. Below is a breakdown of the different costs. 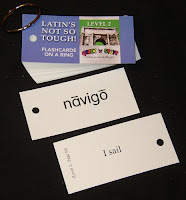 Flashcards on a ring - $8.00. Flashcards are also available in the back of your workbook but this would be worth the price to me not to have to worry with doing them myself! Also available are "short sets" for each level that include the student workbook, answers only answer key, quizzes/exams, and flashcards on a ring for $36.45. 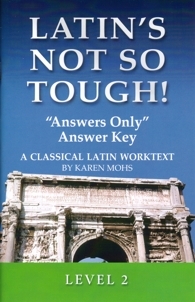 Or you may like the "full set" which includes all the items above - just replacing the answer only key to the full text answer key for $51.40. For more purchasing options on buying all the levels at one time check out these deals. Would our family purchase this curriculum? Yes! The price is really not bad at all for a language curriculum. We will be adding level 3 and 4 to our homeschool library shelf soon. Don't forget to check out what my fellow crewmates thought of this and other products from Greek 'N' Stuff. **Disclaimer: I received a free copy of Level 2 in exchange for my review. The opinions here are my honest and true evaluation!